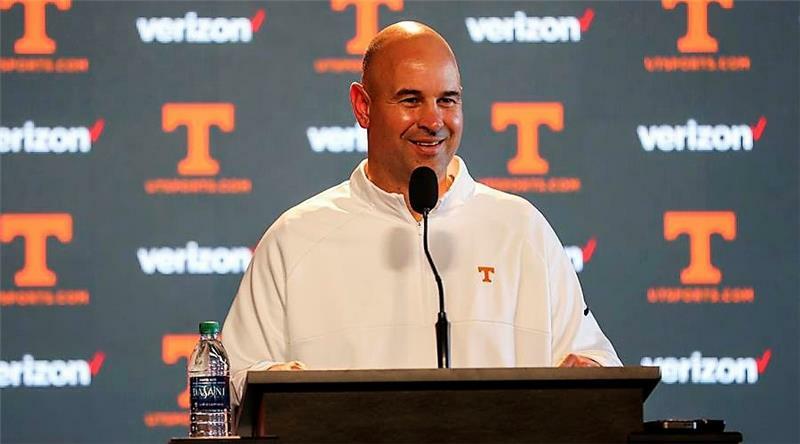 New Tennessee football coach Jeremy Pruitt held his first press conference since helping Alabama win the national football championship Monday in Atlanta. Pruitt now has total focus on his new duties in Knoxville. Tennessee head coach Jeremy Pruitt wasted no time after being a part of his fourth national championship in the last seven years on Monday night. After wrapping up his obligations as Alabama’s defensive coordinator in the Crimson Tide’s 26-23 overtime victory over Georgia in the College Football Playoff title game, Pruitt was back in his office at Tennessee by lunchtime on Tuesday. It’s been a whirlwind month for Pruitt, who juggled recruiting for the Vols and game-planning for the championship game after being named Tennessee’s 26th head coach on Dec.
“I’m excited to finally be in Knoxville and getting started,” Pruitt said on Wednesday in his first press conference as the UT head coach since his introduction to Vol Nation last month. Pruitt is still completing his staff, but he confirmed several hires. The Tennessee athletic department will have an official release on the new assistant coaches in the coming days. Pruitt, who also did a television interview that will air on the SEC Network’s Paul Finebaum Show, was very complimentary of Fulmer, who was named Tennessee’s Athletic Director on Dec. 1, as well as his Alabama boss, Nick Saban, Texas A&M coach Jimbo Fisher and Miami (Fla.) coach Mark Richt. Pruitt served as the defensive coordinator at Florida State under Fisher in 2013 before working in the same role under Richt at Georgia in 2014 and 2015. Pruitt thanked Fulmer for letting him finish what he started at Alabama. He is looking forward to relying on Fulmer, who led the Vols to the 1998 national championship, as a sounding board. Pruitt held a team meeting Tuesday night. He will continue assembling his staff and, of course, recruiting with the Feb. 7 signing day fast approaching. The Vols signed 14 student-athletes in the December early signing period, including seven or eight who will be early enrollees and in class for the current semester that began on Wednesday. "First of all, most of the time after the game your adrenaline is going anyhow. So sometimes it's hard to go to sleep for me. But that was a late game as it was and knowing where I'm going the next day and that I've kind of been waiting on this moment to get it going, it's almost kind of chomping at the bit. I was excited and I didn't get a whole lot of sleep. I received a lot of phone calls. Coach (Kevin) Sherrer, it was a good thing that he was kind of going through the same thing, so he and I stayed up at night and we talked late nights all during the week leading up to game week, obviously just trying to plan the rest of our week and what we were going to do when we got here. You get here, you kind of get started back. Where are we at in recruiting? Where are we at with our players? What do we have to do? What do we have to do with our staff moving forward? It has been exciting." "The first day that we could go out (recruiting), I'm sitting here planning my recruiting for the week. So I'm writing everywhere I'm going to go this week. When I got done, Coach (Tyson) Helton looked at me and he goes, 'You do realize you are the head football coach now?' I just kind of looked at him. 'You only get one time, Jeremy.' I'm used to seeing everybody one time a week. As a head football coach, you get one time for the year. That part I don't really like. I like to go see them once a week for sure." "For us, we've know each other for 22, 23 years. We were talking about what we were going to do at Tennessee. We weren't talking about the game those nights. We were trying to get a plan of 'Hey, have you talked to this recruit this week?' and 'Have you talked to this one this day? Has so-and-so talked to him? Let's make sure you look at these guys.' If you notice, while we've been gone, we still put out a lot of offers and we're not going to put out offers unless I approve of them. We had to watch tape and see it and I wanted to get Kevin's input. After the game, we both flew back together. When you play the game, somebody is going to win, somebody is going to lose. We knew that going into it. That's the way it is going to always be. It's tough for whoever is on the other side of it, so we've both been there on both sides and it is what it is." "We were talking about early signing period for next year. We were talking about the game a little bit to start with and then just kind of talked about official visits, what we're going to do. What's your plan? Again, it's something where you're just trying to get ideas. Anytime I get the opportunity to bounce something off people who have more experience than me, I'm obviously going to do it. The biggest challenge here is just kind of getting it going. We are starting to create the right culture, the expectations of what we want we want to do and who we want to be and basically for the kids to get to know us and understand it. We started that last night. This is something that is going to take time. I don't think you can put a timetable on it, but you've got to start somewhere and we started last night." “First of all, on the offensive side of the ball, coach (Will) Friend will coach the offensive line, coach Helton has coached quarterbacks (and) a number of positions, but he’ll coach quarterbacks here. We’re in the process of filling another spot there and we’ve got guys that are flexible that could move around.